Patterns aren't cheap. Seriously, I was browsing through through the look books at Hobby Lobby the other day and some of them were as much as $20. Tack that on to the price of fabric and other supplies and suddenly sewing your own clothing becomes very expensive. 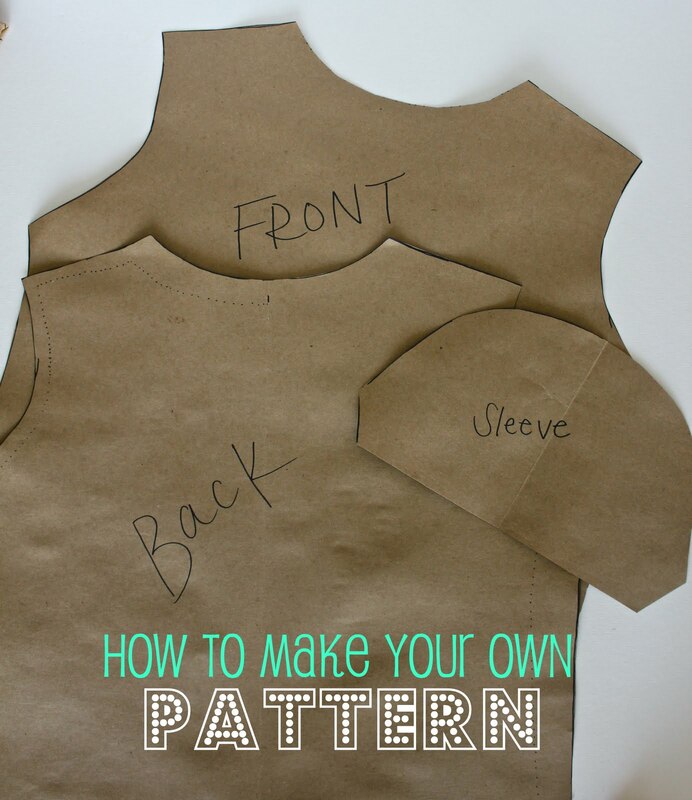 Thankfully, you can make your own patterns using your own clothing that you know to fit well. 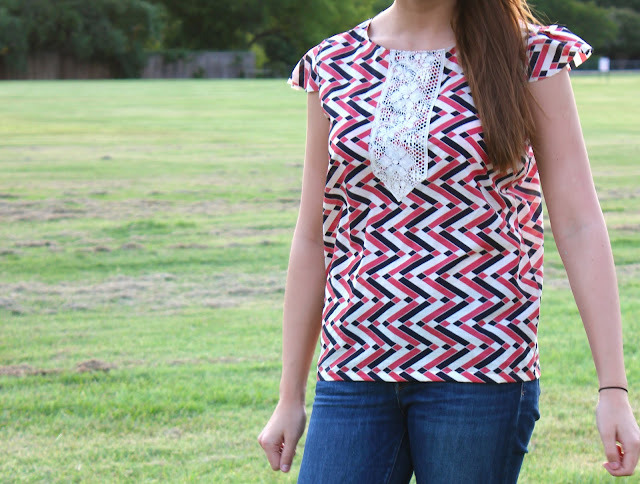 I'll show you how to make a simple blouse pattern using a top of my own. 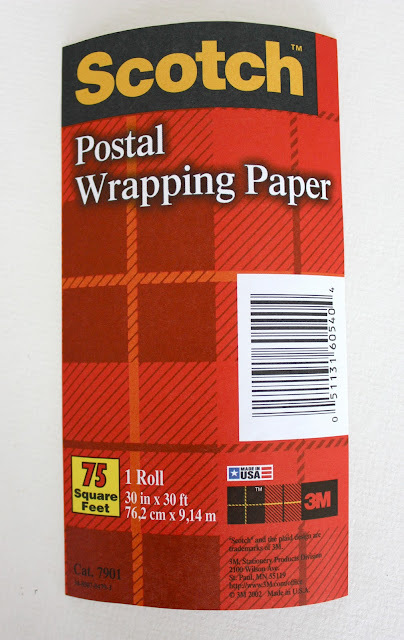 I used Scotch Postal Wrapping Paper as my pattern paper. I found it at Target for about $5. It gives you 30 feet of paper, so it will last a long time. 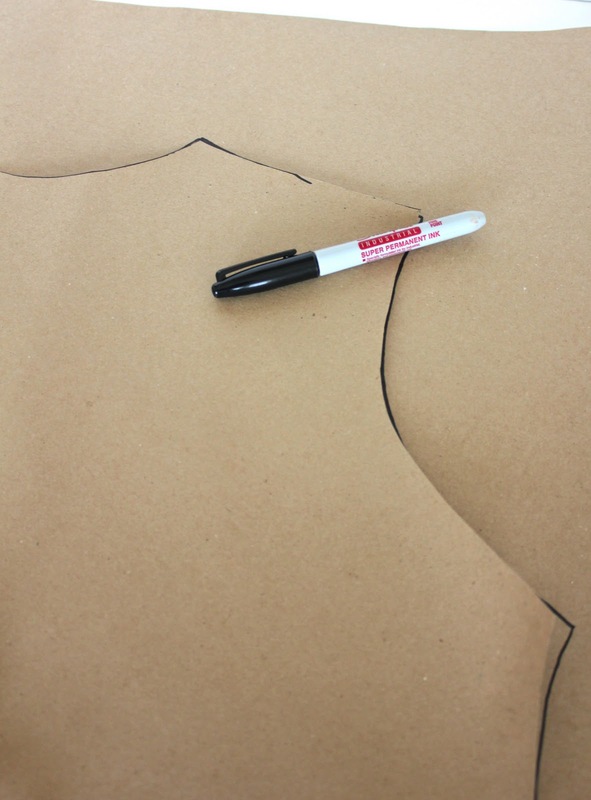 I used paper because I like to lay my pattern piece down and trace the shape directly onto my fabric. If you think you'd prefer to pin the pattern to your fabric and then cut it out, paper may not be the way to go for you. 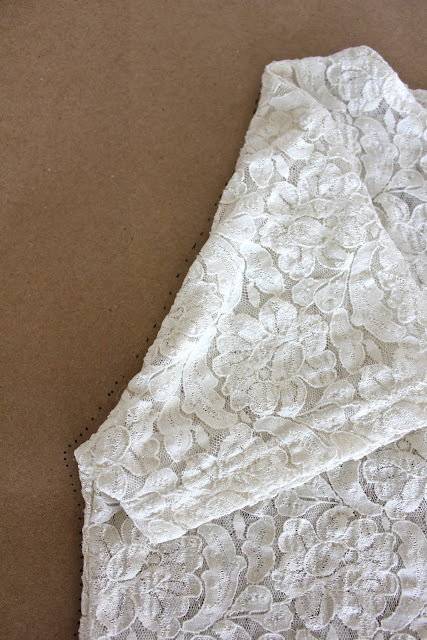 Muslin fabric is another great material that would allow you to pin the pattern piece to your fabric. It's also nice because it can be folded up and stored away when not in use. 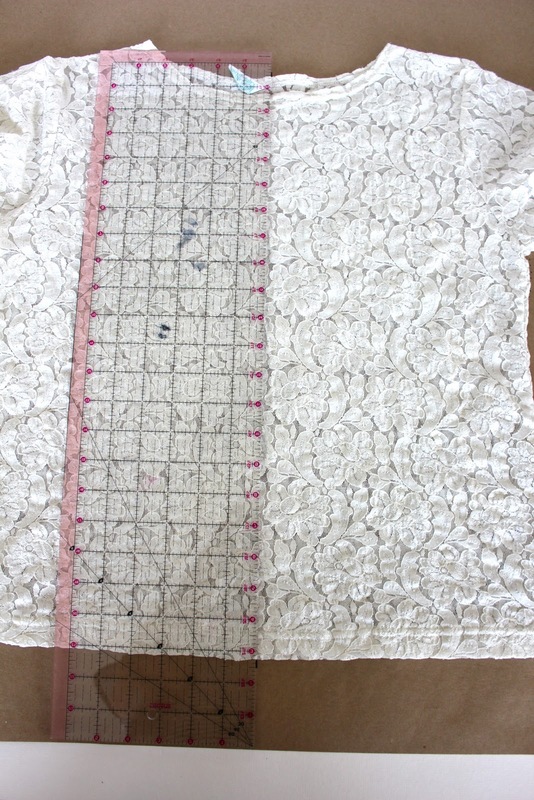 Lay your garment down on the paper and determine the middle of the top. Mark right above the collar and right below the hem. 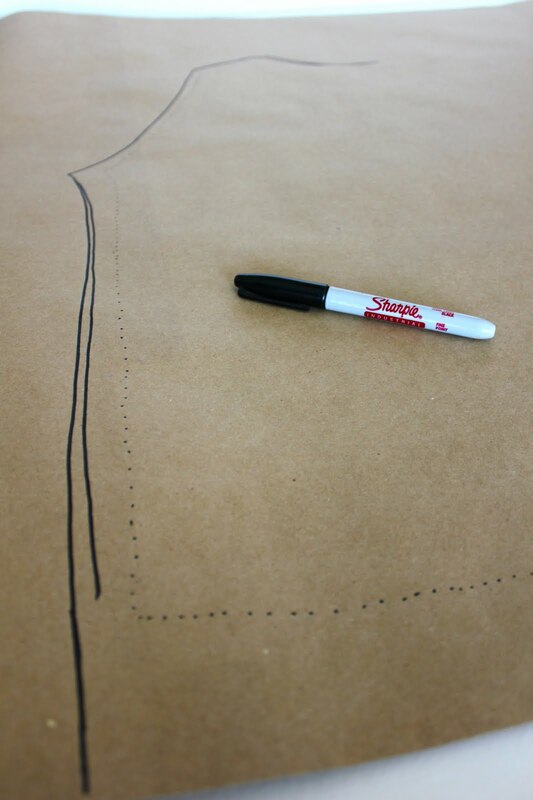 Draw a rough outline of one half of the top. When you get to the sleeve, do your best to fold it back so that you just see the armhole. Sketch the curve as shown below. This first pattern piece I'm working on will serve as the back of the pattern. 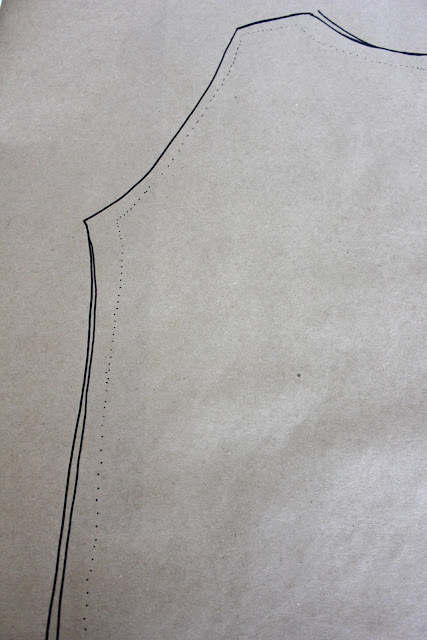 Sketch the outline of the slightly higher, back collar. Stop once you get to the half marks that you previously made. 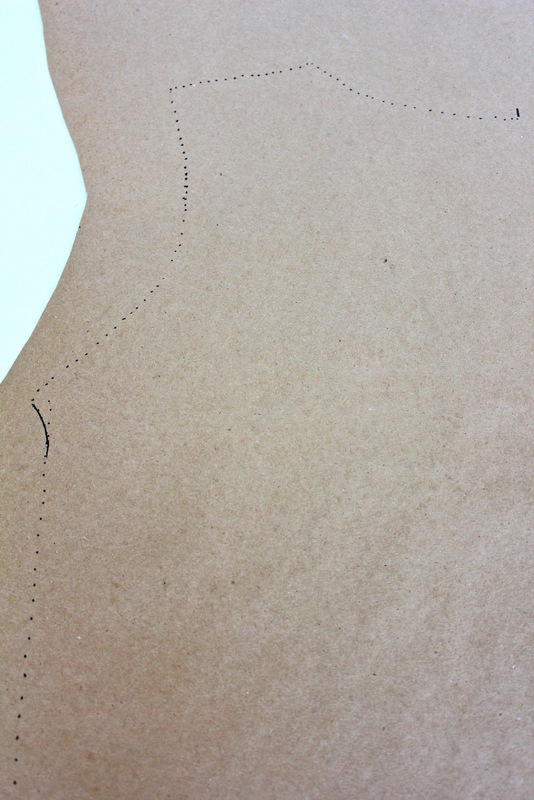 Now you'll need to sketch an outline outside the dotted line to allow for seam allowances. To determine how far apart the rough sketch line should be from the final outline of the pattern you'll need to take what materials you're working with into consideration. 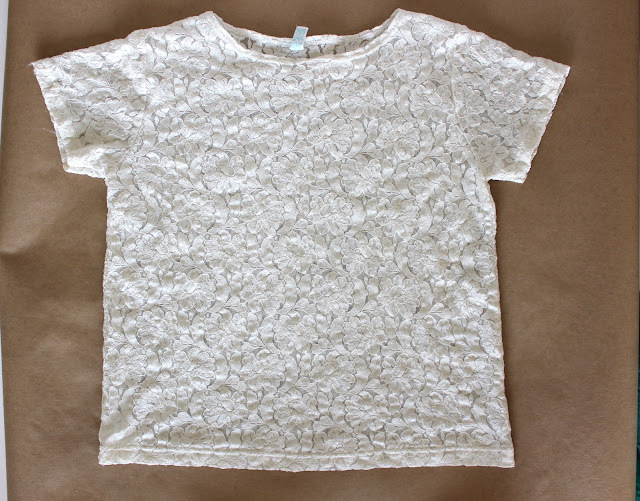 For example: The lace top I am using has a stretch quality to it. If I want to use this pattern to make a top with a non-stretch fabric, I will need to make the final pattern outline a good amount wider than my rough sketch. However, if I was using a non-stretch garment to make my pattern I wouldn't have to allow for as much extra fabric. It's always better to have a too big pattern and therefore a too big top than it is to go too small. Don't be afraid to be generous. Extend the outline by about 1.5 inches along the sides and about 1 inch at the armholes and collar. 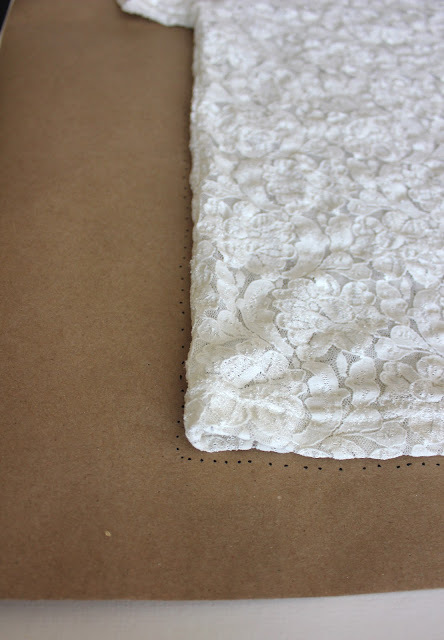 Extend the bottom of the top by several inches to allow for hemming. Cut on the line and fold the pattern over making sure that the crease is on the middle marks you made previously. Trace so that you have a perfectly symmetrical pattern. Repeat the same process for the front piece of the pattern being sure to trace the front part of the collar this time. Now for the sleeves. Fold a piece of paper and position it underneath the garment and the pattern. The fold should be parallel to the top of the sleeve. Trace the curve of the front pattern piece. 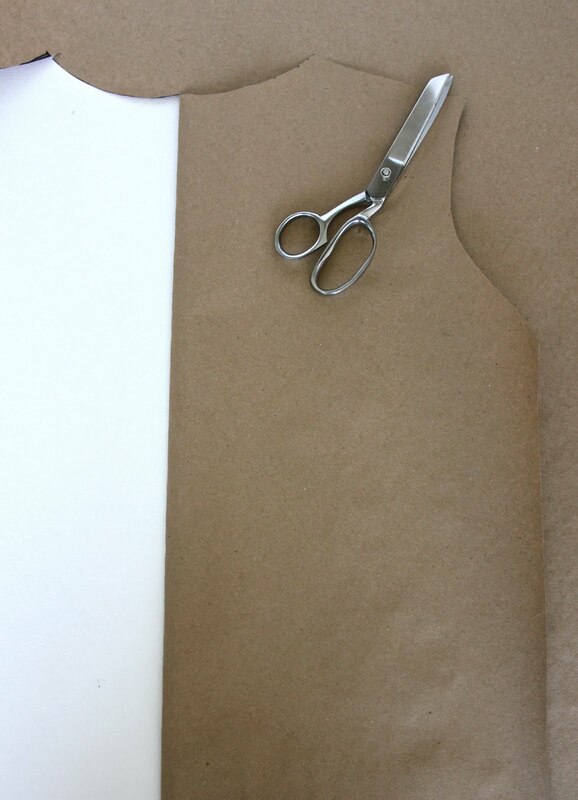 Leave plenty of extra room for the sleeve to be hemmed. Remember it's better to go oversized than undersized. You can always take the shirt in if it is a little too big. Cut out all of your pieces and press to get rid of creases and you're done! I recently used this pattern to make this cute little top. Click on the picture for the full tutorial! Awesome! I've thought about making my own patterns before and have always wimped out because it looks scary. I'm excited to see how your top comes out! Can it really be that simple? Really? No way! I have been scared to make my own patterns for years! Now that I see how simple it is I must admit that I feel a bit foolish! Thanks for sharing. I pinned this so that I can find it again when I need it! AWESOME! girlll you so smart haha. great pattern ideas for sure! This is brilliant! I agree with the other comments, I've always been intimidated by this but now I totally want to try! Thanks Katy! All your tutorials are so great! I needed this!! :) Pinned! and following!! Have a great weekend! If you want a lifetime supply of pattern paper, consider buying a big roll of 'rosin paper' at a home store or hardware/paint store. It's that heavy rosy-colored paper they put down to protect floors after they've been refinished. It is a wonderful all-purpose craft paper. A huge roll is so inexpensive, you won't believe it. Great tutorial! I've made a couple of patterns like this. I always avoid doing sleeves though - I'll give your method a try now :) Cheap interfacing also works well for pattern pieces(not the iron-on type though, you don't want the glue on one side) as you can pin it to your fabric. You can also buy pattern weights which are used in place of pins - that would save you tracing the pattern again onto your fabric. They are just small heavy disks that you sit on top of your pattern piece to hold it in place on your fabric. I have a shirt that I want to make a pattern out of, but it has (small) bust darts. I have been trying to figure out a way to copy it without taking the top apart, do you have any ideas? Spangled, I don't have a lot of experience working with darts but, If it were me I would try to mimic the dart in my outline. As in if it starts small on the bottom and gets wider up top, I would try to draw a parallel line to mimic it. Just try to imagine how large the shirt would look like without the darts and outline with that in mind. Like I said my experience is limited with darts but I hope that helped! Thank you, I was looking for just this kind of help. I have a top that I just love and it is showing some wear. Now I will know just what to do to copy it! I found this through Grosgrain. Fantastic tutorial! Thanks so much. Genius! I love it :) Thanks so much! This is as easy as ABC..cool! thanks for the tute, really helps me with my pattern-making! this is so awesome! thank you for taking the time to share this. My mother uses painters plastic drop sheeting for making patterns. Also, because it is clear, you can trace your patterns so you don't have to cut out just one size. Also it is tough but bendable and pin-able which makes it easier to use than paper. One other use to cut down on the cost of patterns is to use painters plastic to trace patterns your friends have or buy patterns together and share the pattern by copying it. Plastic drop cloths can be found at paint supply stores or your local hardware store. Thanks for the great clothing pattern tutorial. Hi another way to mark the pattern so that you don't risk marking your clothes with marker pen is to put the paper and clothing item on a piece of cardboard, then use a pin to mark the dots. You really can see them pretty easily. That's how we used to do it when I was studying fashion design. :-) I have done this a few times too and it's worked perfectly! Btw. you can easily use paper with pins. Just place your paper on you ironing board. :-) Thanks for a good read. Such a great idea! I'm definitely going to try this out for some back-to-school shirts. Is there a tutorial for dresses or shorts also? Love your blog- discovered it from a Ucreate post on pinterest, which linked me to you :) Keep It Up!! 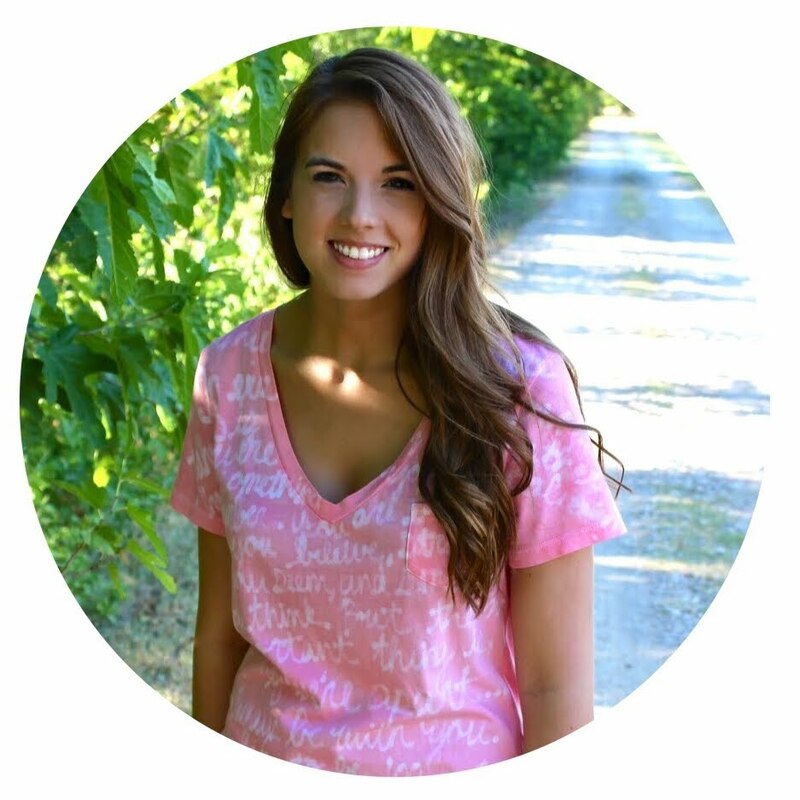 I read (and reread) your blog constantly!! Its so clear cut and simple to follow.FYI the roll of brown paper is sold at Dollar tree for $1!! Im still learning so mhch from you, thanks! I love this tutorial. Very easy to follow. Just another option regarding the paper to use. Though it's not as thick as the brown paper roll, I went to our local newspaper office and purchased an "end" roll of newspaper print. I paid $5.00 for an extremely large amount. I can not tell you exactly how much is on the roll, but I have used it for making patterns, covering my kitchen table when doing "grandchildren" projects, and other crafting ideas. I use banner paper from one of the large office supply places. It holds up when you use the pattern more than once and is easy to see any areas that you need to mark. Kind of stupid to lie to people who are searching the net on a quest how to MAKE THEIR OWN SWEING PATTERN and see a girl who had an ugly tshirt and decided to make even uglier tshirt but in the process she managed to score the attention of others... ehm. Did no one ever thought of the concept of LIE around here? Nice tutorial. But I will point out that if you have a Joanns near you, you can find patterns on sale, sometimes as low as a dollar. Usually not more than $4.00. I save a lot of money that way. I have finally dusted off my sewing machine and much to my mum's delight doing more than edging my cross stitch fabric! I live in Vietnam and fabric is cheap but no patterns to buy so am going to get some paper and create some of my own. Thanks so much for the tutorial, it makes perfect sense and me feel that I can actually achieve something wearable! I've been making my own patterns for years using this same method. My preference for pattern fabric is to use the cheapest drapery lining I can find. It's 60" wide and is only about $2.00 per yard when Jo Ann's has their home fabrics on sale. I write the name of the item on the front of the patten and use a big safety pin to keep it all together after folding. I've recently started taking a photo of the finished item and pinning it into the bundle. So easy to reference a pattern you might want to use again. this is a great idea! i did something similar to make my linen vest last year with newspaper! That is a great "tutorial" kinda article I must call it. After reading it, now I'm feeling like sit with a piece of cloth, pencil, scissor, and make something. :-P But it ain't so simple as it looked. It requires talent which you have. I appreciate you sharing this info! I've been curious to know what I would need to do to be able to create my own shirt, but didn't know how to go about doing it. This gave me some great insights though, and I can't wait to actually get started. Great design clothes online tutorial! Helped me with my own patterns I'm working on. brilliant..!! !it look so easy..thanks for sharing.. This is such a sweet idea. I love the dress fabrics choices and how easy you've made it. Thank you for your so cool post, it is useful, I love it very much. Find more collection here mens tank top. Awesome! Thanks for this post. I'm excited to make my own shirt. I noticed someone asked about shirts they like that have darts. Do you have a post that covers that? I'd love to read it. Oooh kimono - thank you - I'm off to make/copy the pattern (saving around £7 + postage minimum), as I know exactly what I want but can't find anything like it in the shops, and after gaining weight haven't sewn any clothes for myself for many years - this will be fun! Thank you!! Thanks a lot, I was looking for tutorial for doing may proper pattern. This is a great idea. Thanks a lot for the tutorial. Plus, you might really benefit from two things, iron the item before taking the pattern and turn it insideout for a really crisp edge. It helps me at least.